It started, like many travel stories do, on Pinterest. 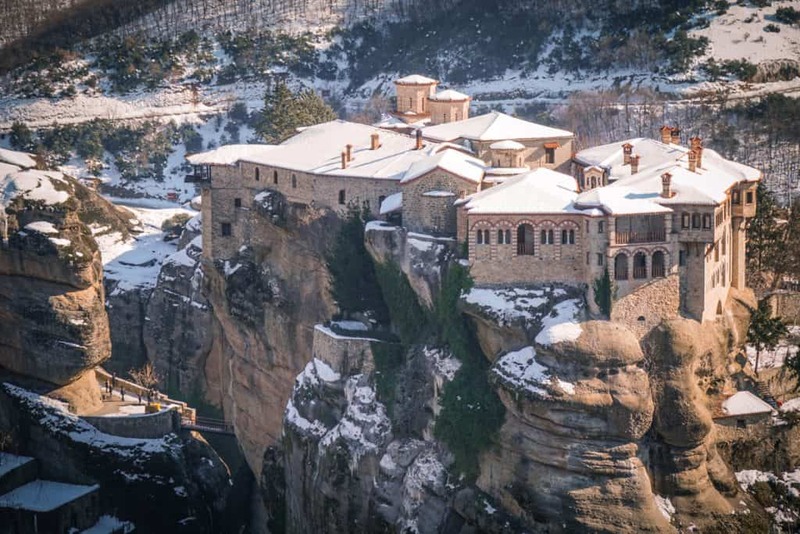 I saw the photos of Meteora – monasteries from centuries past stacked improbably atop rocks that look straight out of the Jurassic era – and knew that it was something that, one day, I had to see with my own eyes. Despite traveling around the Balkans for the majority of the last three years, mainland Greece has by and large been a huge hole on my Balkan map. 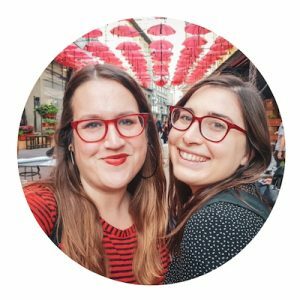 I’ve visited and photographed my way through Athens. 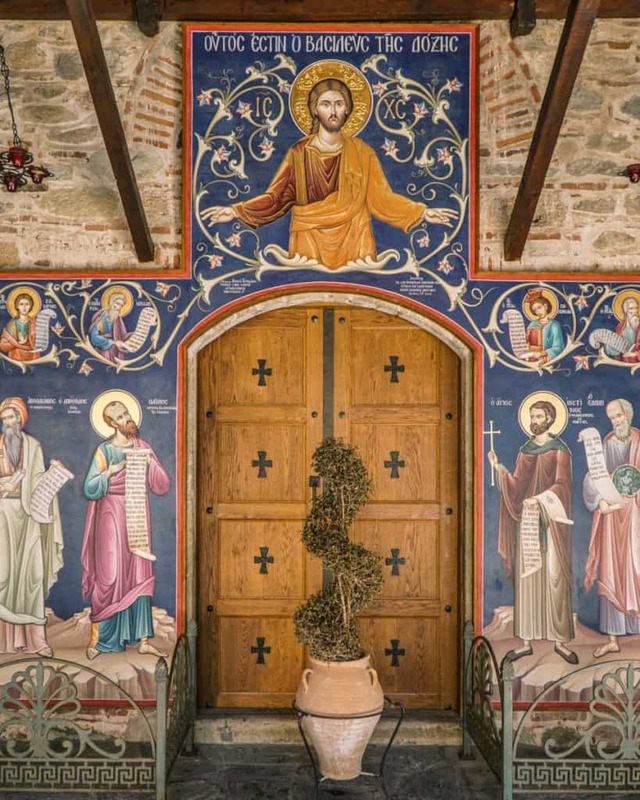 I spent a few days in the chilled out beach town that time forgot, Agia Triada, when my first plans to come to Thessaloniki were foiled by a festival which made hotels and Airbnbs in the city prohibitively expensive at the last minute. And of course, I’ve done my share of island hopping. 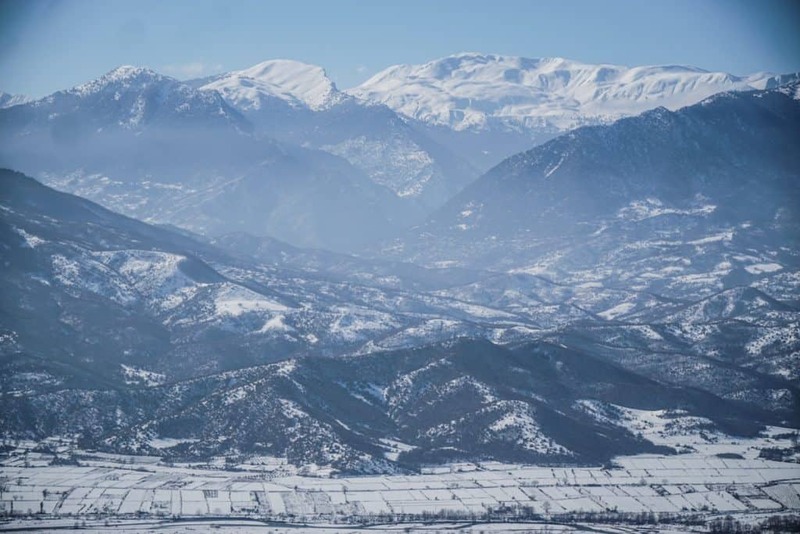 But Northern Greece, particularly Thessaly, has gone overlooked. Until today. 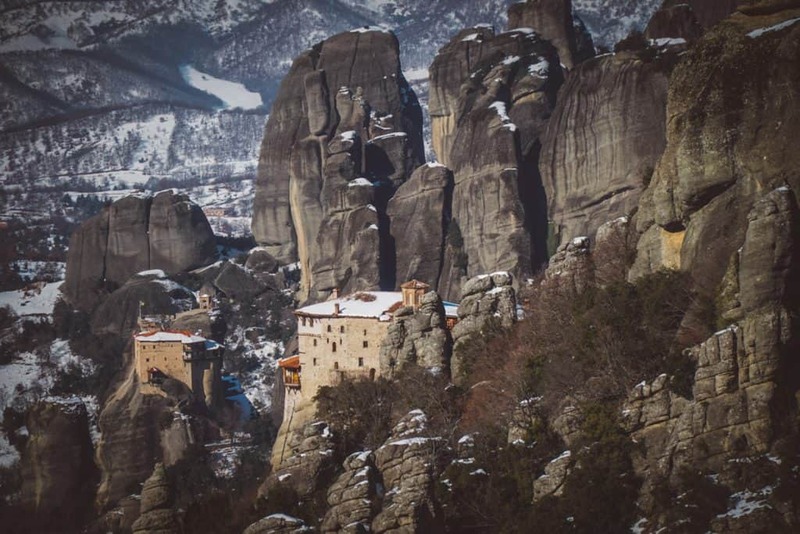 As I’m spending three weeks in Thessaloniki this January, I decided to take a day trip to Meteora. Winter travel comes with its perks – there were barely any other tourists around. 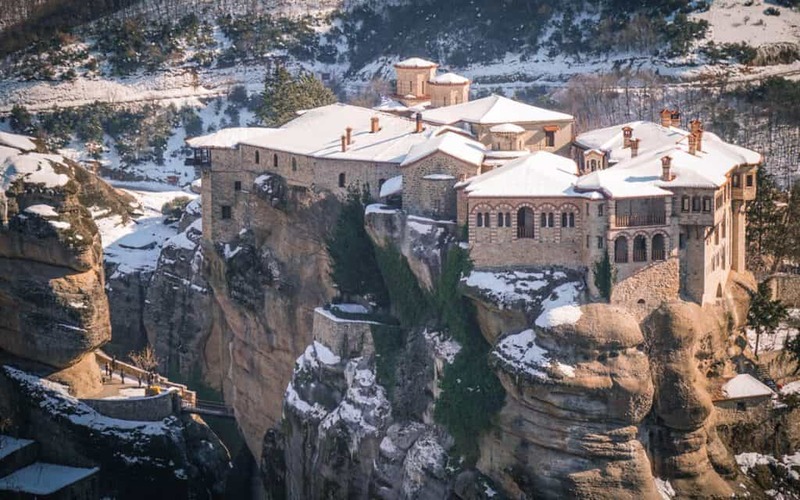 And the photos of Meteora covered in snow? I simply don’t think I’ll be able to top these. 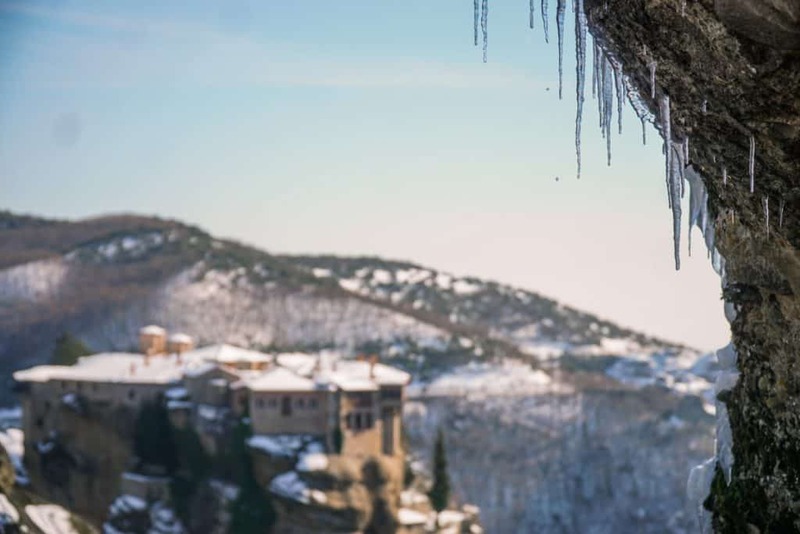 If you haven’t heard of Meteora yet – or aren’t yet convinced to go – here are 25 Meteora photos that will have you anxiously scrolling Skyscanner for your next travel hit. 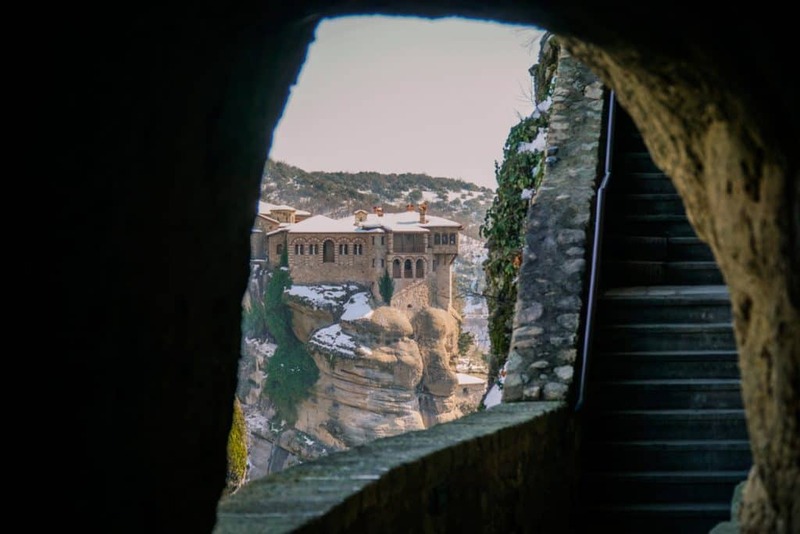 Your first glimpse of Meteora is the most magical. No photo of Meteora can ever quite do it justice, no matter the talent of the photographer (or in my case, lack thereof). 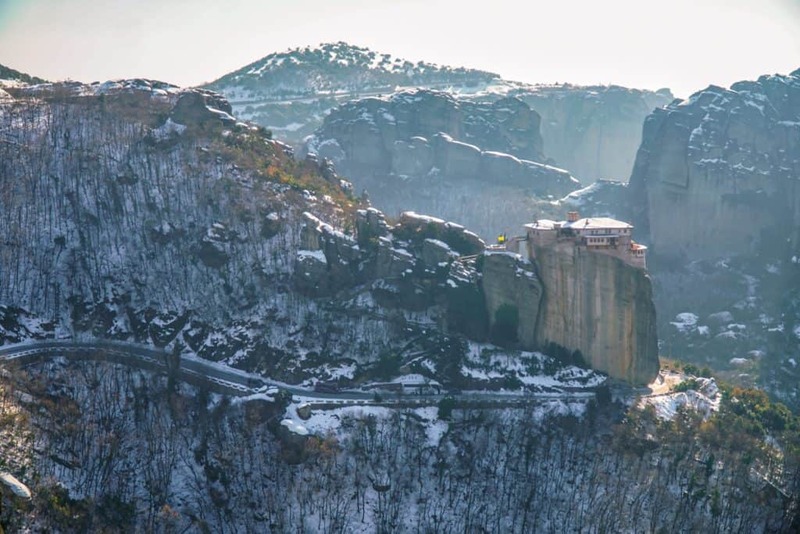 Meteora is about scale and contrast, sure, but it’s also about improbability and dedication — two things nearly impossible to capture in a mere picture of Meteora. 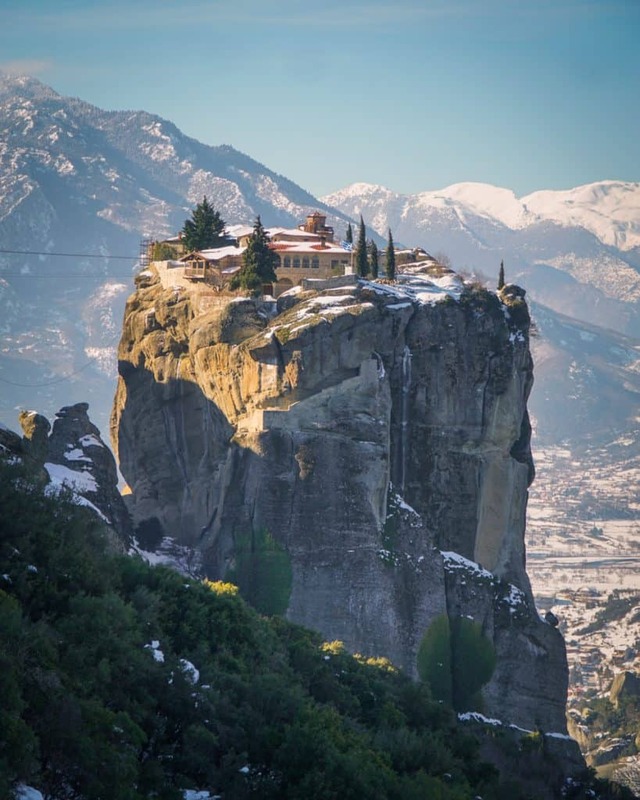 Perhaps the most iconic of the six monasteries of Meteora, the Holy Trinity Monastery is the most isolated and hardest to get to. 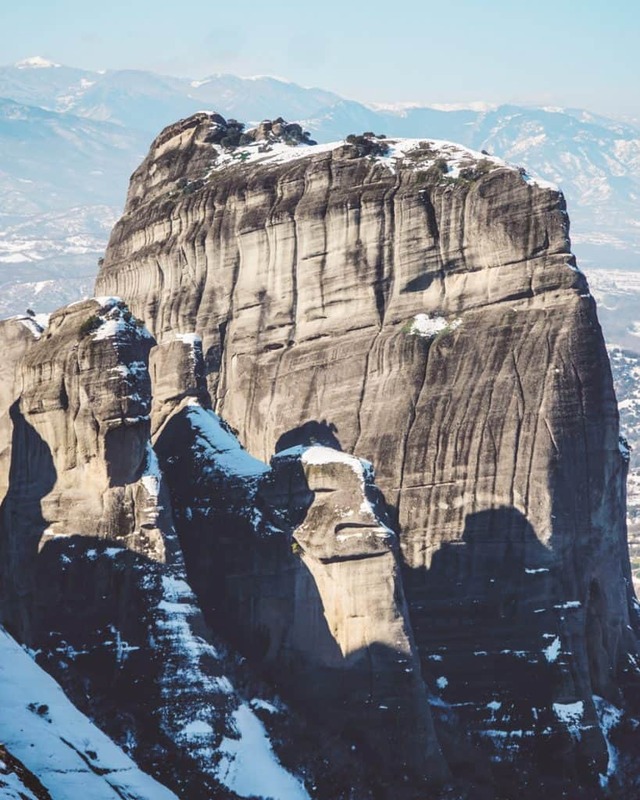 The dramatic height of the staggering rock pillars that make up Meteora drastically change the landscape with the passage of time, as shadows cut new angles across the valley. It would truly be hard to take the same photo of Meteora twice. 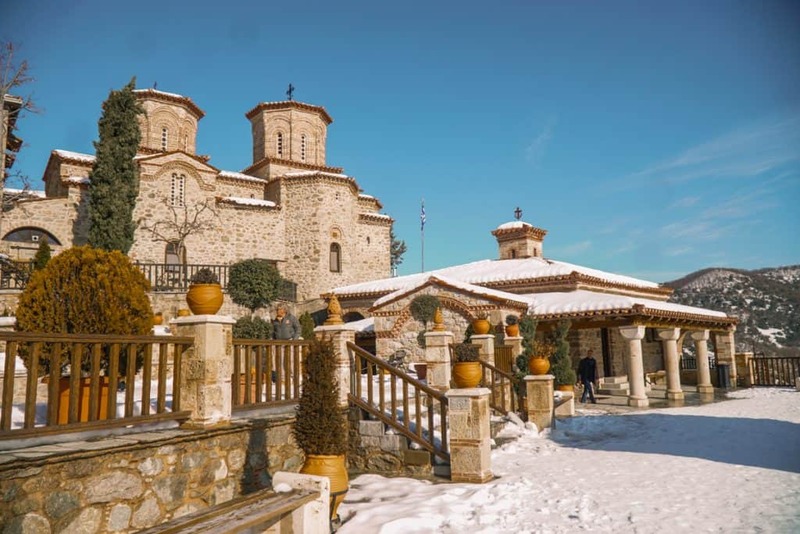 The first monastery we attempted to visit was actually a nunnery, but unfortunately it was closed unexpectedly – a natural side effect perhaps of visiting Meteora in winter when the tourist season is at its all time lowest. 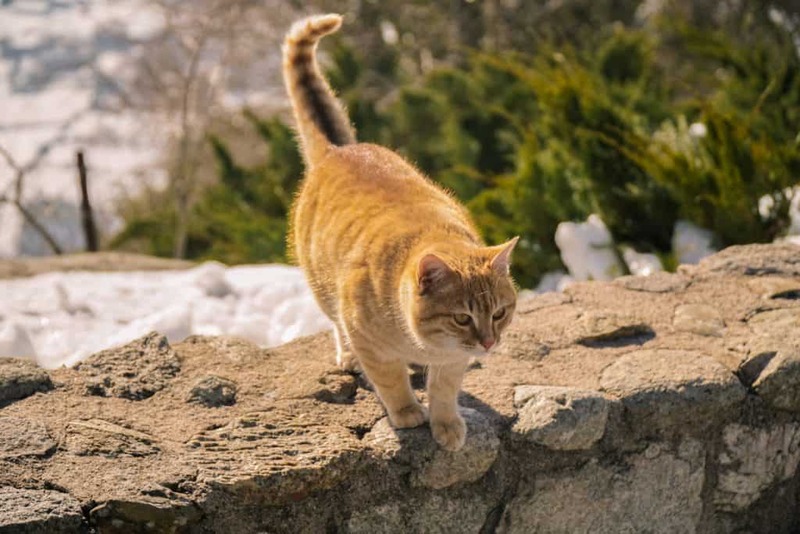 Yet while the nuns may not be accepting visitors today, the well-fed and curious monastery cats surely are – you’ll find them approaching you quizzically at nearly every monastery, curling around your legs or even hopping into your lap if you sit down next to them. Saint Stephen may have been built in the sixteenth century, but it has a more decidedly modern look to it. Built on the plain rather than atop one of the rock pinnacles, it was susceptible to damage and abandonment during WWII, whereas other monasteries escaped such fates. 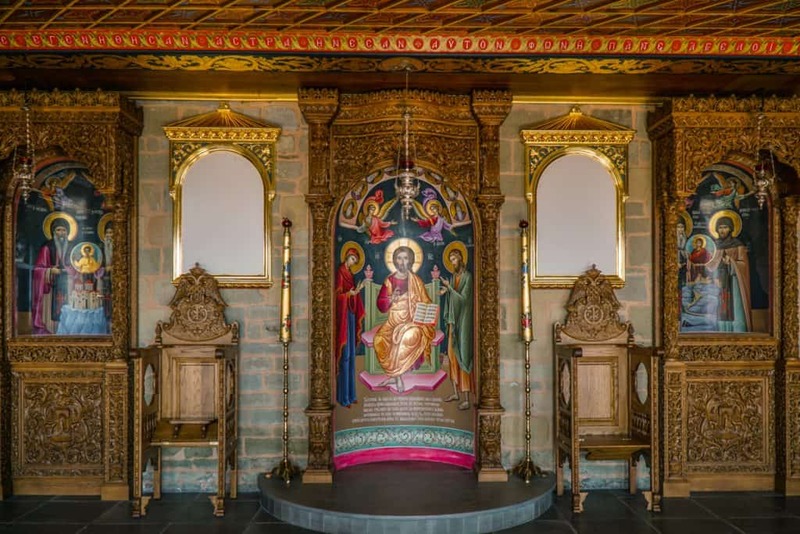 In 1961, the nuns restored the monastery, giving it a slightly untraditional facelift that delights upon a closer glimpse. The main monastery area is clustered opposite to St. Stephen’s and Holy Trinity Monastery, built atop rock outcroppings further north. The monasteries inside are surprisingly large complexes, built for many to create a community amidst the isolation. If you look in the bottom left corner, you can spot the other two monasteries that make up this cluster of four monasteries in the north. 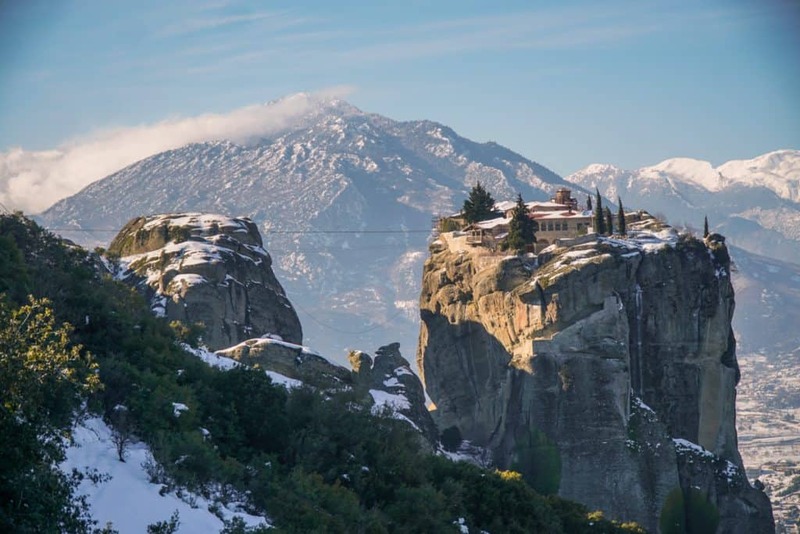 Most Meteora tours will have you visit two monasteries. As St. Stephen’s was closed, we visited Great Meteoron (the largest) and Varlaam (the second largest). 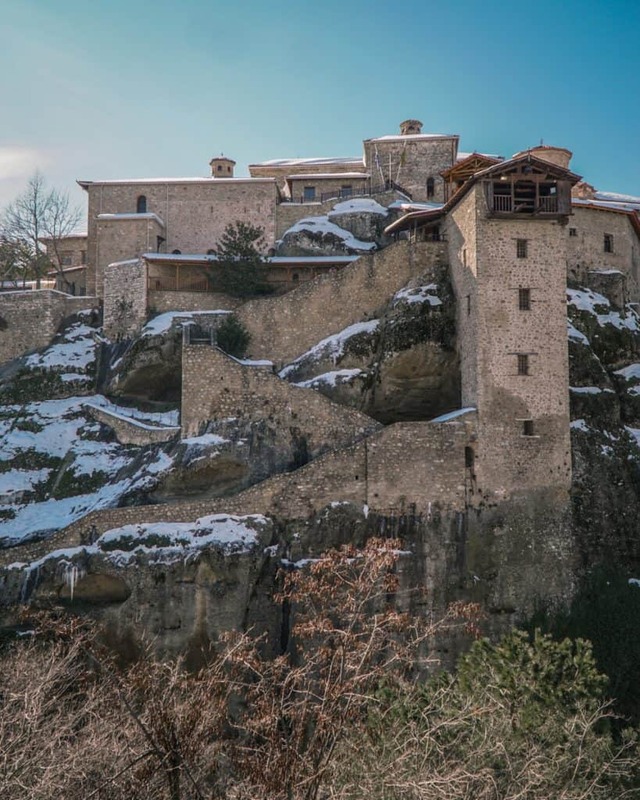 A closer look at the two more isolated monasteries in the northern cluster, the Monastery of Rousanou, with 13 nuns in residence, and the Monastery of St. Nicholas Anapausas, with a single monk living there. 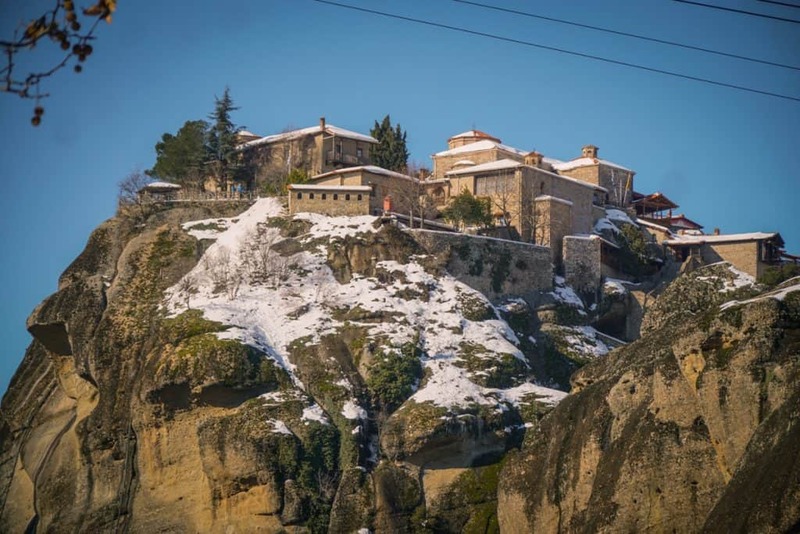 While many don’t associate Greece with the cold, in Meteora winter usually means snow and near-freezing temperatures. 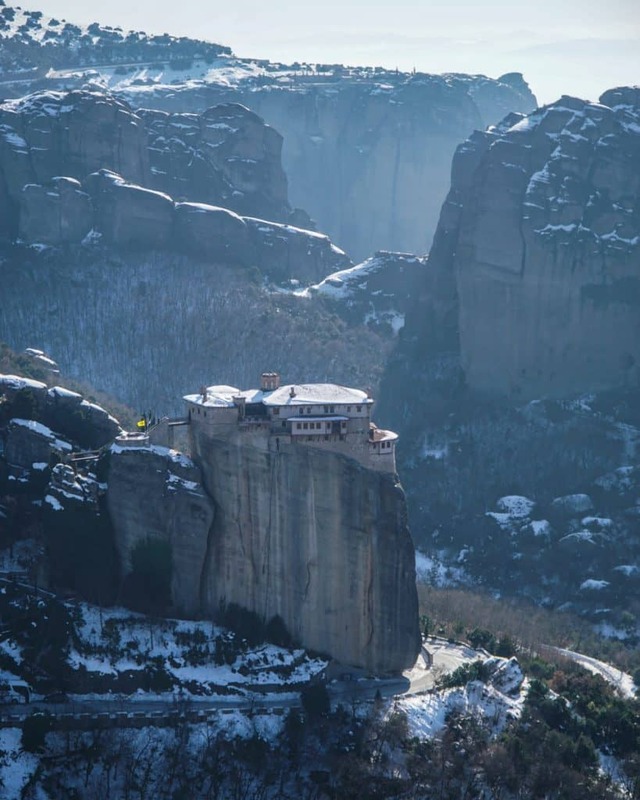 But brave the cold and you’ll have better photos of Meteora than everyone else who were stuck in the summer crowds. 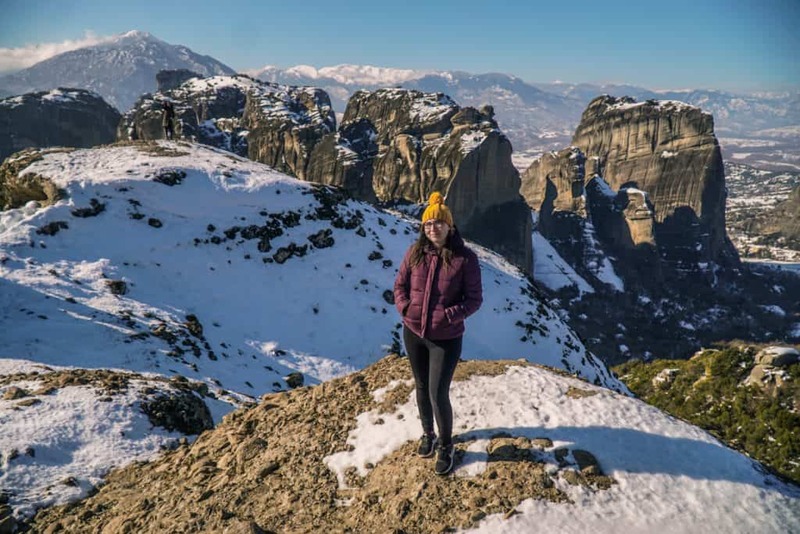 The solitude of Meteora in winter gives you the chance to see and sense things you would normally rush through on a large group tour. 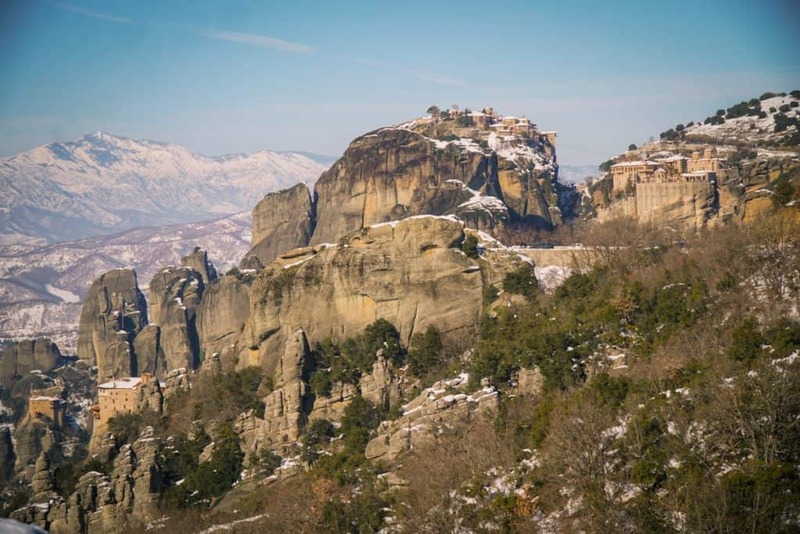 Visiting Meteora in January, my tour consisted of only three people – one of them myself. 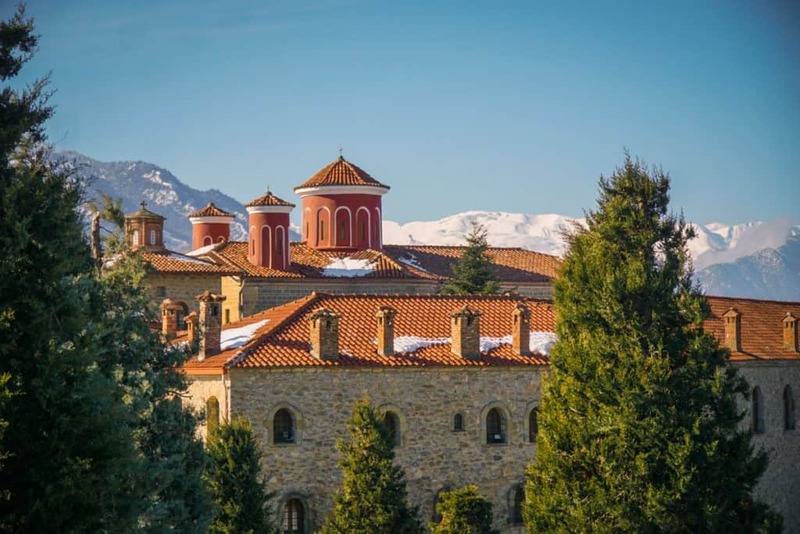 While only the second biggest monastery, Varlaam has the most monks in residence – a whopping seven (the nunneries for whatever reason are more populated). Inside Varlaam is a functioning and beautiful church which you are not permitted to photograph. Taking photos of the beautifully painted antechamber, however, is allowed. 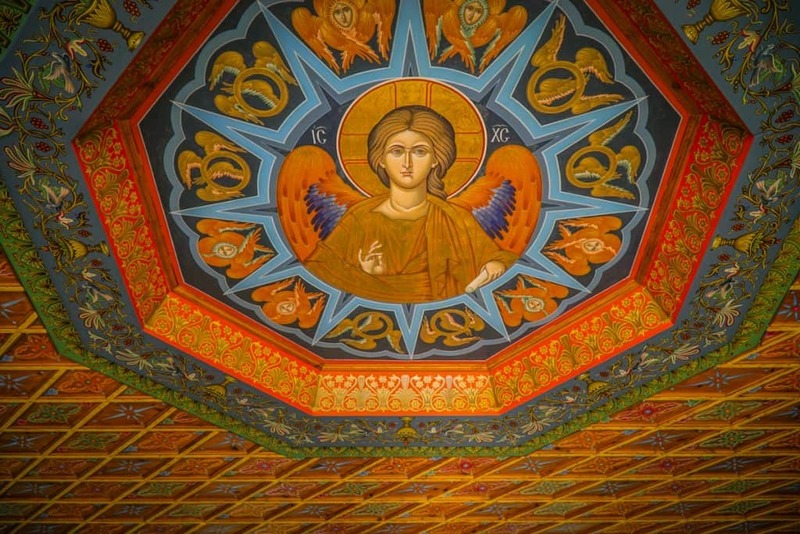 And lucky for that, because what a ceiling! While the monasteries look extraordinary from the outside, in actuality, they veer to the plain side on the inside — probably so as not to distract from the incredible views literally every way you turn. I couldn’t tell you the purpose of this building, but my was it ever photogenic. Let me reiterate that no photo of Meteora can ever do this UNESCO site justice. This, however, is my attempt to start. The same monastery as seen from a slightly different angle. Next up was Grand Meteoron, whose entrance somehow reminded me quite a bit of Bran Castle in Romania, with its stairs and forbidding height. It’s where I captured my favorite photo of Meteora. Like Varlaam, the interior of the monastery is rather plain, but not without its Easter eggs for lovers of symmetry like myself. 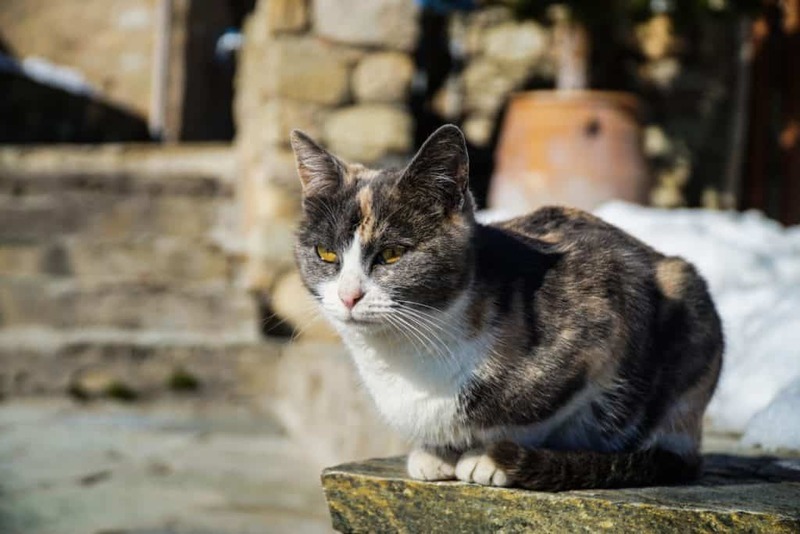 It was also home to the cutest monastery cat of the day, who was clearly enjoying a peaceful Meteora winter day without too many tourists to bother her. 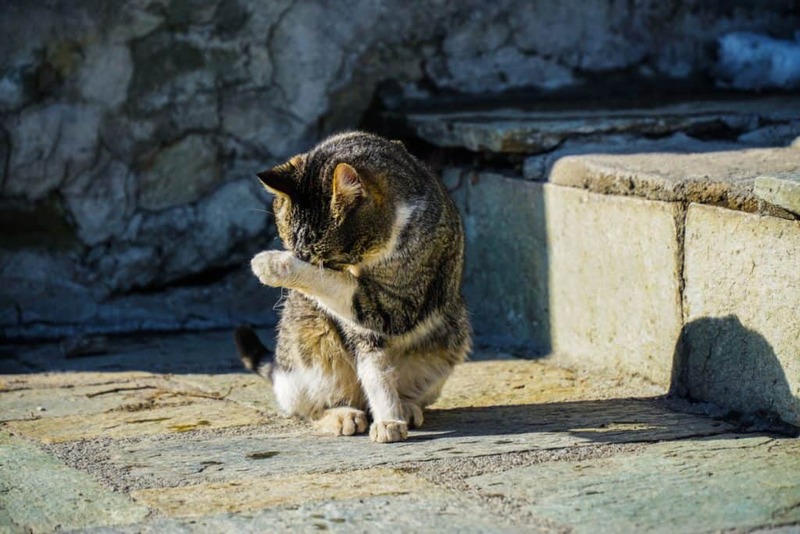 Although this camera-shy cutie ran a close second. 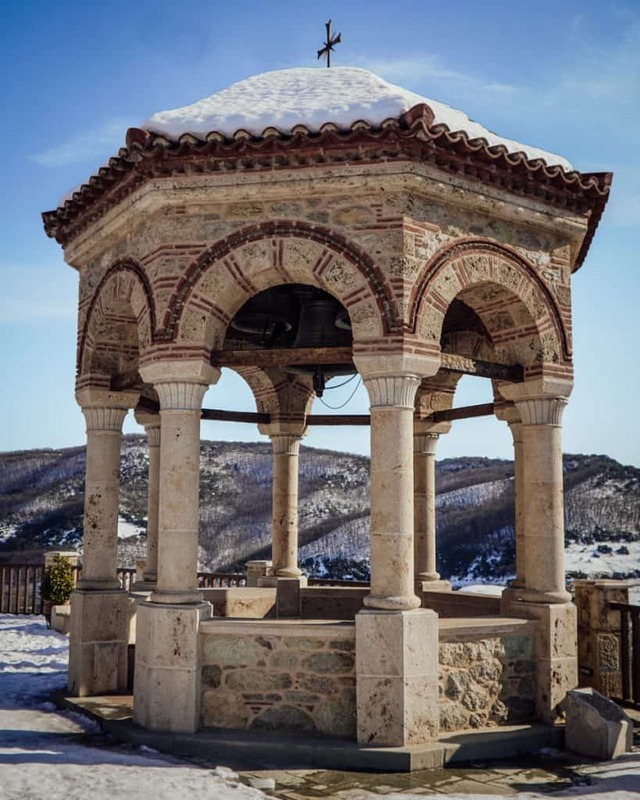 From Grand Meteoron you have stunning views over the towns of Kastraki and Kalabaka, as well as the stunning Pindos mountain range in the backgorund – another worthwhile destination to explore in Greece. 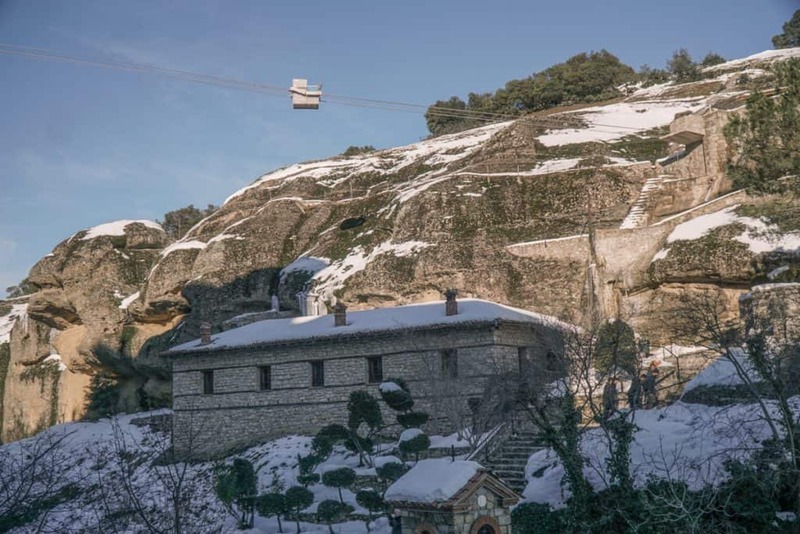 I loved watching the ‘cable car’ go back and forth, ferrying supplies between the road and the monastery so that the monks wouldn’t have to constantly take the stairs – a tiny dash of futuristic anachronism in for those living a life so rooted in past traditions. But what I loved most was the outstanding view of Varlaam Monastery you were able to get as you walked up the stairs. It almost made all hundred-odd stairs worth it. 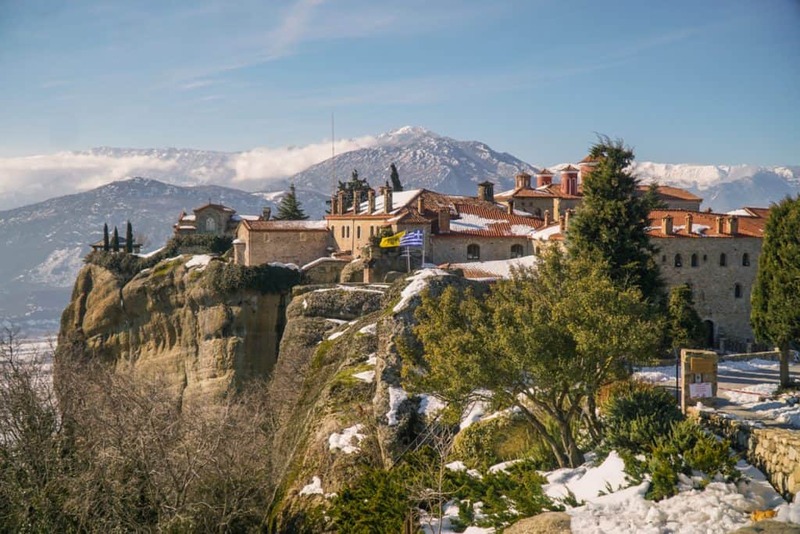 You can get to Meteora easily from either Thessaloniki or Athens. It takes about 3 hours in each direction from either city. Contrary to what you’d expect, taking a group shuttle tour is actually more economic than taking public transportation, as trains in Greece can be a little pricy. In Thessaloniki, I took this exact guided tour to Meteora. You can read my full write-up here. Stephanie took a guided tour when she visited from Athens a few years ago, which is similar, but goes by rail rather than shuttle bus as my Thessaloniki tour does. This is the tour she recommends for seeing Meteora from Athens.